One of the great pleasures of touring this year has been gathering groups of smart, accomplished people in a room and then asking them about their worst experiences with Imposter Syndrome. I heard raw truths from creators in Chicago and San Francisco, who then brought their wisdom to bear on what we can do to make ourselves feel less alone in the face of these challenges. These conversations were complex and enlightening, and I’m so glad to make them available for you all to listen to on the web (thanks to the support of my rad team on Patreon). Check out the audio players below to find two new episodes featuring wisdom from Craighton Berman, Michi Trota, Suzanne Walker, Bobbie Johnson, Molly McLeod, and Rose Eveleth. I’ve got a bunch of new conversations going up soon, so be sure to keep an eye out if you’re in need of more things to listen to. Enjoy! It’s Day Four of the Inner Critic Investigation series I’m collaborating on with writing coach Deb Norton! We’re hoping these prompts can give you all some insight into what your little jerks are thinking and feeling as they go about trying to stop you from making creative work. The Inner Critic loves to tell us about all the other things in the world that it believes are more important than working on our creative projects, from taking naps to volunteering at the local food bank. Whether it’s trying to tempt you or shame you, write it all out in a list. What does it think you should be doing instead? There will be a new prompt once per day for the rest of the week. This is a great exercise to do as a warmup before you sit down to tackle your daily NaNoWriMo goal, or just launch into creative work of any nature. There are no wrong answers. Go wild. If you want to listen in to a whole conversation about this Creative Resistance stuff, check out this talk I just recorded with Deb. It’s Day Three of the Inner Critic Investigation series I’m collaborating on with writing coach Deb Norton! We’re hoping these prompts can give you all some insight into what your little jerks are thinking and feeling as they go about trying to stop you from making creative work. What is precious to your Inner Critic? What do they value above all else? Fame? Security? The knowledge that they’ve successfully prevented you from making a mistake? Let’s take a brief trip back in time to January, 2016. I appreciated her candor at not knowing the first thing about making a podcast, and simply figuring it out as she went. I enjoyed the camaraderie of listening to ideas and practice exercises from other listeners. Most of all, I loved the way it helped me think about my storytelling work from a nonjudgemental, process-oriented standpoint. It was a community—not just a product. So I tweeted about the show and how I much I was enjoying it, which I think is why she ended up watching this talk I’d given at The Animation Workshop in Denmark and following me on Twitter. It was one of those “WHOAAA A REAL CARTOONIST IS LOOKING AT ME WHAT DO I DOOO” moments, which I can tell you from experience everyone has. 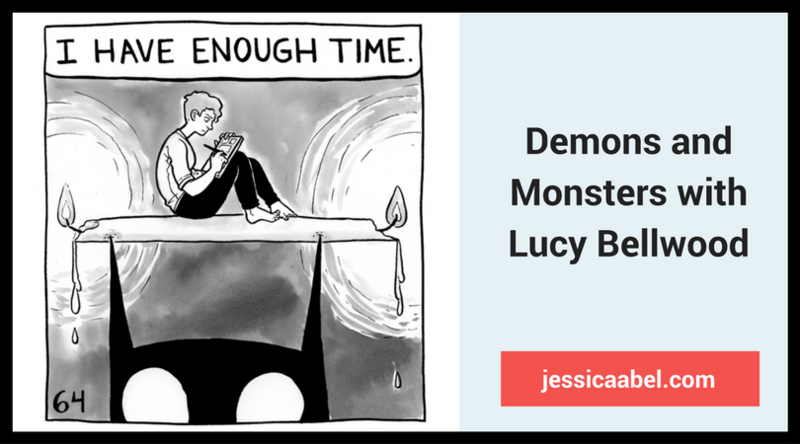 Jessica co-authored Drawing Words and Writing Pictures, which was a really formative book for me back when I was getting into drawing comics and couldn’t find a program that had the rigor I really wanted from a formal perspective. Fast forward to this summer, when she wrote and told me she’d been teaching workshops about a creature called The Should Monster that was super similar to my inner demon. Jessica’s students had pinned their inner critics to the page, just as I had, in order to defuse their power. Then she asked if I would be interested in collaborating on a live, online event—part interview, part Q&A—where we could discuss work-life balance, creative practice, and social media. I was beside myself with excitement—especially because our dates aligned with the launch of my new Kickstarter, which explicitly deals with overwork and self doubt and a million other things. 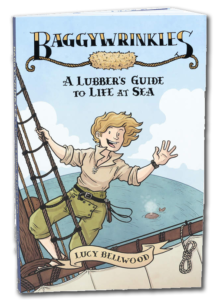 And then she wrote this essay about it and I had to come to grips with the idea that somewhere along the way, I had become a working cartoonist. And what’s more, I was good at it. I had learned some things that other people might find useful, and someone I really admired wanted to get that knowledge out to a wider group of people. It’s not going to silence the little voice that claims I’m a phoney forever, but it’ll definitely do for today. So here’s our upcoming event! 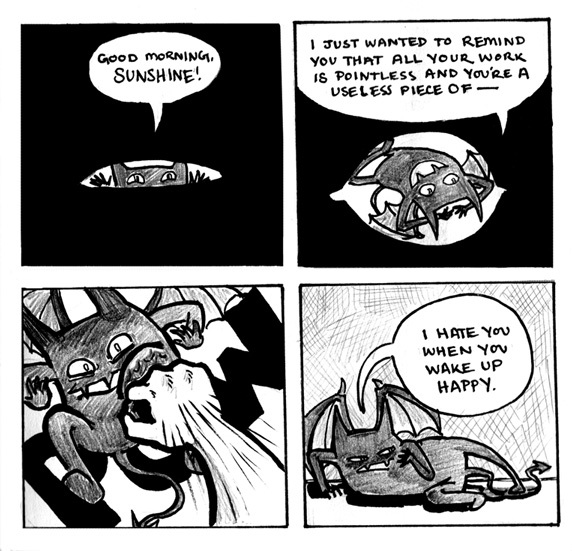 and fighting off the Should Monsters and Self-Doubt Demons that want to stop us from making it. Ask your questions and get some answers! There will be a replay for those who can’t make it, but you only gain access by registering, so be sure to sign up either way. July 25 (next Tuesday) at 12:00 noon Pacific, 3 pm Eastern, 9 pm European. 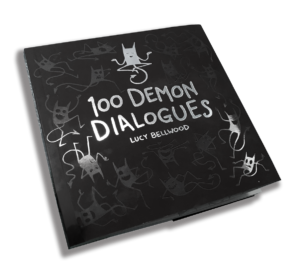 At this link: https://www.crowdcast.io/e/demons-lubellwoo ! So reserve your spot here, and we’ll see you soon! If you like spaceships, comics, radio drama, and the practice of making things, let me recommend a really fun podcast! The Galaxy of Super Adventure is part one part galactic adventure saga, two parts creative advice round-table. It’s run by my comics pals Ben Hatke, Zack Giallongo, and Jerzy Drozd, and this week’s episode (all about FEAR) features a guest appearance by yours truly! I play Bold Space Adventurer and Sensitive Artist Lucy Bellwood, crashing in for a talk about artistic anxiety and self-doubt with the help of my sentient French mustache sidekick, Polly (pictured above). The whole series is a hoot, and I highly recommend listening to it from the start, but if you just want to jump in for this episode, check it out here. Enjoy! As you’ve probably all noticed, this month’s Inktober challenge has morphed into something of a themed exercise for me. 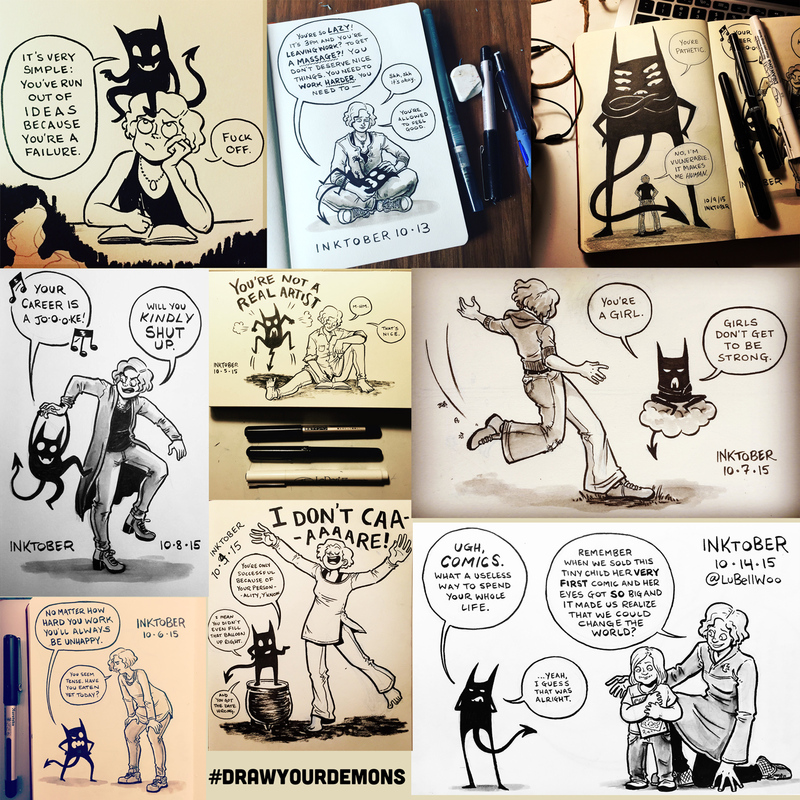 I’ve been illustrating my horrible little self-doubt demon in his many forms, trying to name some of the fears and anxieties that everyone deals with (in one form or another) when they sit down to make work. Here’s a selection from the first half of the month. If you’d like to join in, please do! I’m trying to keep an eye on the #drawyourdemons hashtag and I’d love to see what your little jerks say and how you respond to them. Anyway, I’m contemplating putting all these illustrations together in a little minicomic when the month is done. If you’d like in on that, keep an eye out on Twitter. Happy Inktober!